Joie paisley top, Motel Rocks bikini, Brixton ‘Joanna’ hat, Jeffrey Campbell ‘Bastia’ sandals, Chanel sunglasses. Millau striped triped maxi from LF Stores, Groceries Apparel ‘Wolff’ crop top. I celebrated the first official day of summer in New Hampshire with my best friends and my favorite summer styles. Wide brimmed hats, oversized sunglasses, and slide sandals are my current summer staples. And I’m so glad that the world has finally decided to ditch the old myth that black and blue don’t mix—it’s my go-to color combination these days. For a polished poolside look, I tend to reach for a solid-colored swimsuit when I want to wear a printed cover-up, and vice versa. A crop top with a maxi skirt is a classic and easy summer combination. I love this cream-colored Groceries Apparel top so much that I bought two. Something about the cut just stands out to me. Groceries Apparel products are made from 100% organic and recycled materials, and though I’ll admit that I don’t typically go out of my way to buy environmentally friendly clothes, it’s always good to be aware of the low-impact labels that have high-impact style. Photos by Brooke Appe. 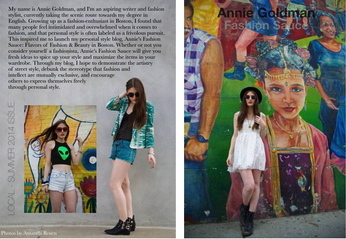 Annie’s Fashion Sauce is featured in Local Magazine New England’s Summer 2014 issue! You can browse the Style Section online for no cost by setting up a free account with MagCloud.com, or you can order a hard copy for $6.60. Photos by Amanda Rosen.